The Man Who Jump-Started Presidential Debates Four years before the famous Kennedy-Nixon face-off, a student at the University of Maryland wanted to see whether the nominees in 1956 — Dwight Eisenhower and Adlai Stevenson — might want to engage with students. His effort failed, but ultimately set in motion the televised debates we know today. 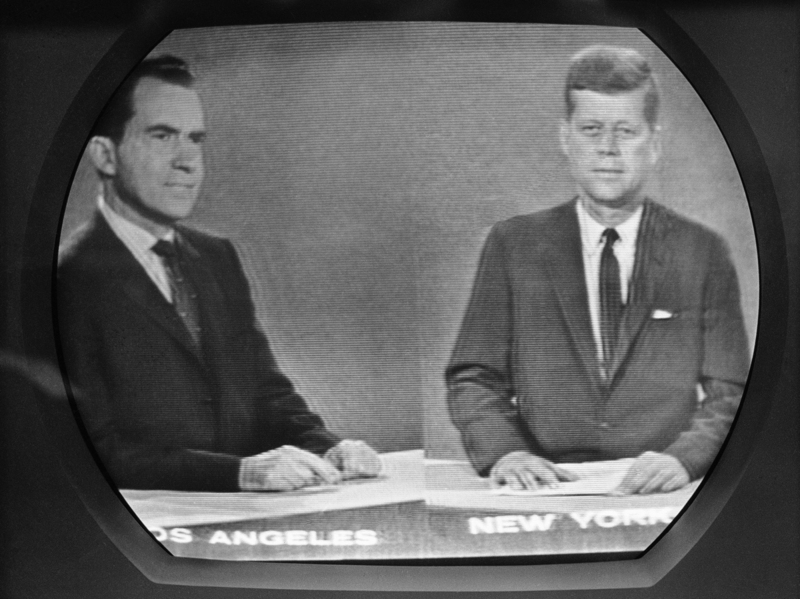 Vice President Richard Nixon listens as Sen. John F. Kennedy talks during their televised presidential race debate. This photo was made from a television screen in New York, Oct. 21, 1960. President Obama and his Republican challenger, Mitt Romney, are prepping for Wednesday's presidential debate. It's a well-worn tradition now, but it wasn't always that way. The 1960 Kennedy-Nixon face-off wasn't just the first televised presidential debate, it was also the first presidential debate in more than a century. Four years earlier, a young German emigre named Fred Kahn, a student at the University of Maryland, wanted to see whether the nominees — Dwight Eisenhower and Adlai Stevenson — might want to engage with students. He wanted the nominees to answer questions from a panel of students at the university. Kahn enlisted the help of the school's International Club and started writing letters to everyone he could think of. Eleanor Roosevelt even wrote him back, Kahn tells Guy Raz, host of weekends on All Things Considered. "She said not only would the students of the University of Maryland be interested, but also other students," Kahn recalled. "And that she was going to forward my two letters I had sent to the campaign manager of Stevenson." But just when it looked like everyone was interested, Kahn's lan fell through. "The Board of Regents passed a law banning political speeches on campus," he said. The club had to rescind its invitations, but even though Kahn's efforts failed that year, he'd changed the conversation. "I went to The Associated Press and the UPI who circulated it nationwide so that I was interviewed and made the newspapers," he said. "And the idea of debate, which was then considered an anachronism, became a subject of conversation, so that in 1960 they were offered three times on television."